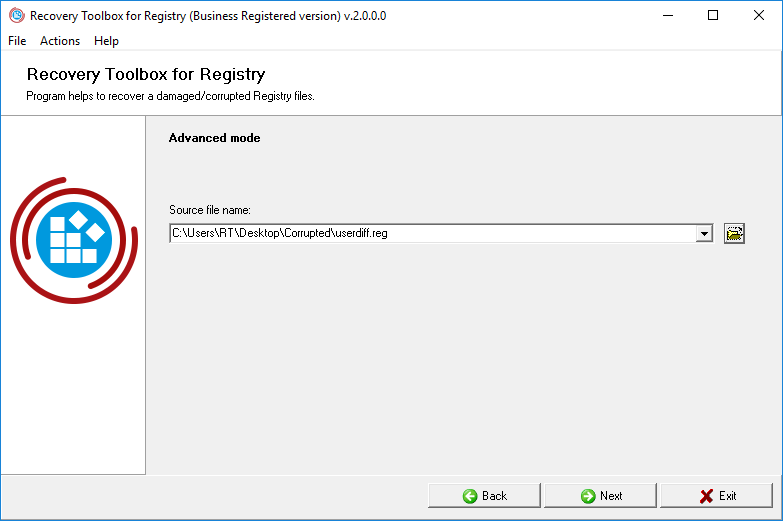 Recovery Toolbox for Registry (Download) is a tool that efficiently fulfills complex registry recovery tasks while being extremely easy to learn and use. We tried our best to make the interface of the program as clean, unambiguous and self-explanatory as at all possible. 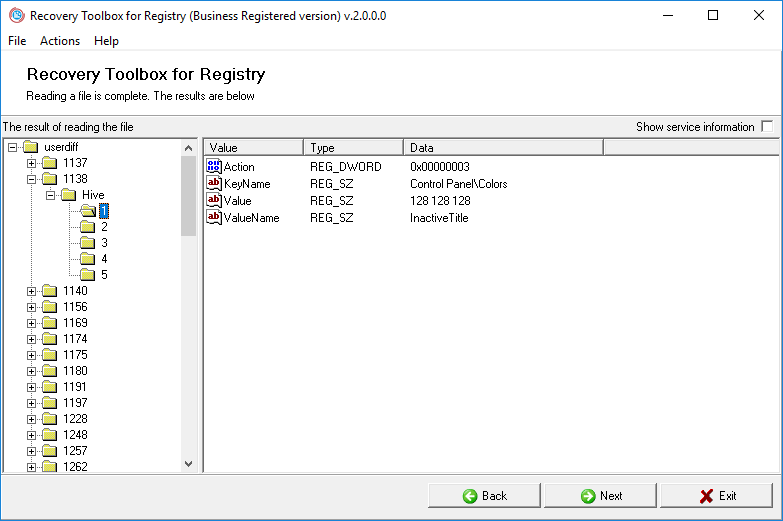 Recovery Toolbox for Registry can be used in two modes - Automatic and Manual (advanced). The automatic mode is the fastest way to recover data from a damaged registry file, while the slightly longer manual mode gives you more information on what is going to be recovered from the damaged file. The recovery mode can be chosen on the very first page of the wizard by clicking a corresponding button in the center of the program window. If Recovery Toolbox for Registry fails to recover data in both modes, you can use the Send source file command from the main program menu. You system registry will be attached to a new email message (the default email client will be used) and sent to the developers of the program. Once the file is received by the company's customer service department, they will try to recover your data and will use this opportunity to improve the program's recovery algorithms. You will be contacted as soon as possible with an update on the results of their effort. Please bear in mind that the program does not allow you to recover the registry files of the operating system you are currently using. In the automatic mode, Recovery Toolbox for Registry will search your local disks and will find the registry files on your system drive, but you will not be allowed to select any of them from the list. If you need to recover data from a damaged registry file, use the advanced mode to select the file you will be working with or connect a storage device (hard drive, USB drive, optical disk, network or virtual drive) with a damaged registry file (or files) to your system and use the automatic mode to scan it. The duration of each step directly depends on the size of the file being processed (the number of records in it) and the speed of your CPU. Please note that the file analysis and recovery phases may take up to several minutes, especially on slower systems. Below is a detailed user's guide for both modes. Should you have any questions about the program, please do not hesitate to contact our support department. We will be glad to assist you with your problem. To recover registry data in the automatic mode, click the Automatic mode button on the main program screen. 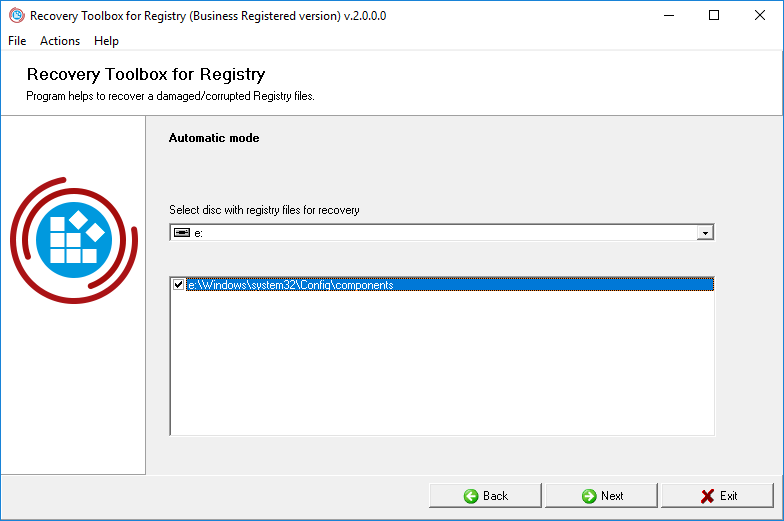 Recovery Toolbox for Registry will create a list of disks in your system and will show your primary system disk first along with the paths to folders containing registry files. As explained above, the automatic mode does not allow you to recover data from your current system registry, so these folders will not be selectable in the list. However, if you connect a drive with damaged registry files located in a system folder, you can use this mode to quickly find and restore them. Once the folder has been selected, you can proceed to the next step by clicking the Next button. The program will ask whether you really want to proceed and, if the answer is affirmative, will load the next screen of the recovery wizard. This step of the wizard is fully automated. Recovery Toolbox for Registry will automatically create a backup copy of the source registry file and save it under a new name according to the following mask: [file_name]_backup_YYYYMMDD_HHMMSS. For instance, if the name of your registry file is system, and the backup took place on April 9, 2010 at 11:22:34 AM, its backup copy will be system_backup_20100409_110234. After that, the program will analyze the structure of the registry file, scan all of the available keys and parameters and save them to a new system file. The duration of this process depends on the complexity and size of the file being recovered and the speed of your computer. This is the end of the recovery process in the automatic mode. You can quite the program by clicking Exit or go back to the file selection step using the Back button. By selecting one of the previously used files from the dropdown list that can be opened by clicking a small button with a downward arrow in the right part of the input field. Once the folder has been selected, you can proceed to the next step by clicking the Next button. The program will show a confirmation window and, if the answer is affirmative, will load the next screen of the recovery wizard. This is the second and the last step of the recovery process. 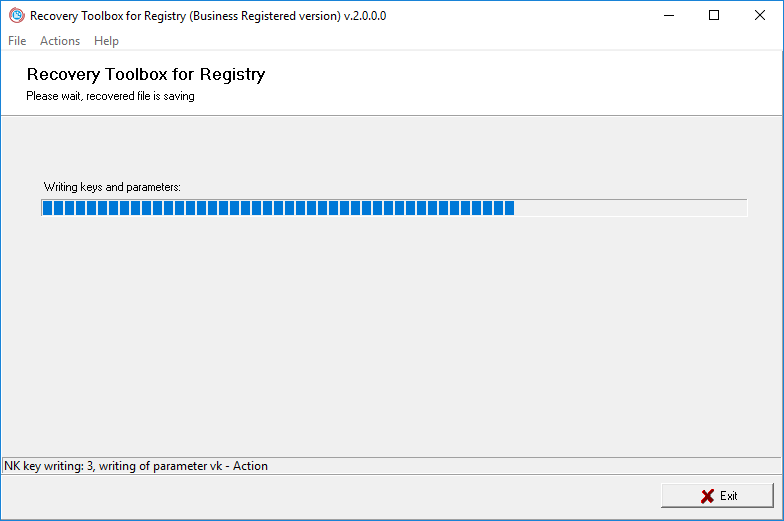 First, Recovery Toolbox for Registry will analyze the contents of the file, which may take some time. Once all of the keys and parameters have been identified, the program shows them in the form of a tree. In addition to just browsing the file's internal structure, you can enable the Show service information option to show low-level key attributes in the lower right area of the program screen. If you are satisfied with the recovery results, you can proceed to saving your data to a safe location. Use the Save button to open the standard save file dialog and specify the name and location of the output file. This is the end of the manual recovery procedure. If you want to recover data from another file, use the Back button to go back to the first step - file selection. As you noticed, the program is extremely easy to use. However, if you have any problems with the Recovery Toolbox for Registry, please don't hesitate to contact our support department.